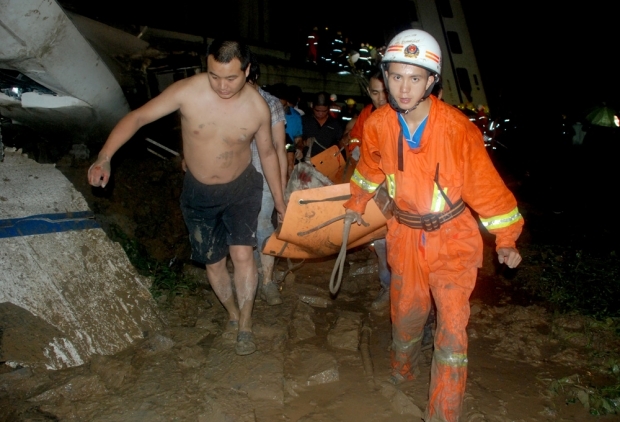 Firefighters and volunteers rescue survivors of a high-speed train accident in which two train carriages derailed and fell off a bridge after a lightning strike knocked out power on the line as the train was travelling between the cities of Hangzhou and Wenzhou, in Zhejiang province, on July 23, 2011. The train went off the rails around 8:30 p.m., Xinhua news agency reported, citing local firefighting sources. No casualty figures had been officially announced nearly three hours after the accident, but Xinhua said the capacity of each car on the train was about 100 passengers. After a long and hot July marked by the near-absence of most of our guests, Sinica host Kaiser Kuo is pleased to be back this week leading a discussion of the recent accident on the high-speed Hangzhou-Wenzhou rail line, an accident that has shattered public confidence in the rail system and undermined one of the most public symbols of China’s economic and technical resurgence. And while we don’t want to downplay the human tragedy involved, we do have to ask: why all the fuss? After an abortive attempt to quite literally bury the accident, the state has acquiesced to an explosion of public indignation over the accident. The outcry has become particularly visible on microblogging site Sina Weibo, and raises the question of why. Is this a sign of a general loosening of propaganda controls, a greater radicalization of the Chinese middle class, or perhaps even an internal power struggle within the arms of the Communist Party? This week we consider the evidence for all these interpretations.